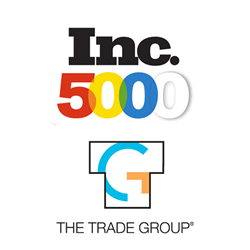 This is the fourth consecutive year The Trade Group has made the Inc. 5000 list. The company’s upcoming relocation of its corporate headquarters to Grapevine, Texas will help ensure the organization’s ongoing plans for growth. The Trade Group has realized unprecedented growth due to ongoing investments in state-of-the-art technology and equipment, top talent and continual expansion of products, services and education for employees and clients alike. Stephanie Chavez, Marketing Director at The Trade Group, attributes the company’s growth and recognition by Inc. to the firm’s creative ingenuity, cutting-edge technology and a focus on building enduring partnerships with valued clients domestically and abroad. The Trade Group’s upcoming relocation to Grapevine is one of the organization’s many commitments to long-term growth and providing the level of service the company’s clients expect. “We wouldn’t be where we are today without the continued support of our clients and the trust they have placed in us. To provide the optimum client experience year over year, we can’t be complacent. In recent years we have invested heavily in technology and equipment – to the point where our team can handle nearly every aspect of our client’s projects in house. The new facility in Grapevine will allow us to push the envelope even further,” Stone says. To learn more about the trade show and live event products and services available through The Trade Group, call 800-343-2005 or visit http://www.tradegroup.com.